RG Cosmetics CC Mask Silver for Blonde to Gray Hair 946ml/32oz - Just Beauty Products, Inc.
RG Cosmetics Professional Color-Correcting Hydrating CC Mask. Exclusive Option in Silver (for Blonde to Gray hair). – Color-Correct hair tones (exclusive for Blonde to Gray hair). – Hydrates hair while reviving and renewing color. – Protects hair from damaging Sun rays (hair sun block & shield). How to use: Wash hair with CC Shampoo Silver and towel-dry. 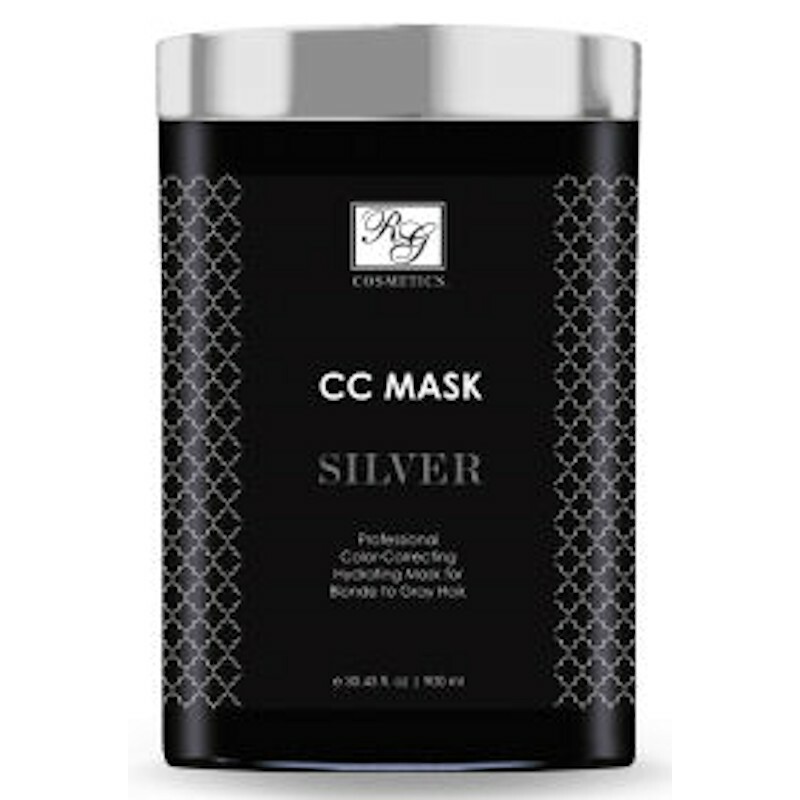 Apply a generous amount of CC Mask Silver evenly throughout hair. Place plastic cap over hair and let product sit 5 to 15 minutes. Rinse hair with water, making sure hair is free of product. Style as usual. Note: Hair results may vary depending on hair. It is recommended to check hair after first 5 minutes with plastic cap to see if the desired results are being achieved. Ingredients: Aqua (Water), Eau, Cetyl Alcohol, Ethoxydiglycol, Behentrimonium Chloride, Ceteareth-2, Cetrimonium Chloride, Ceteareth-25, Parfum (Fragrance), Cocos Nucifera, Gardenia Tahitensis, Coconut Oil, Acrocomia Aculeata (Oleo de Macaúba) Seed Oil, Basic Blue 99 (Cl 56059), Basic Brown 16 (Cl 12250), Basisc Brown 17, Basic Yellow 57 (Cl 12719), Retinyl Palmitate, Panthenol, Ascorbic Acid, Citric Acid, BHT, Methylchloroisothiazolinone (and) Methylisothiazolinone. Use only as directed. Keep out of reach of children. Avoid contact with eyes. In case of contact with eyes, flush thoroughly with water. If redness or irritation develops, discontinue use immediately. store in cool and dry place. Made in USA.